What happened to what we as Albertans (and Canadians) have always been proud to embrace: a strong sense of community? The good news is that it hasn't gone anywhere. Communities in each province and territory across Canada will create sections of the overall mural that will connect Canada through art. Every participating city or town will create a section of the mural made up of 400-750 individual tiles that symbolizes their community. Each of these Community Mural sections will stand alone as a mural for that particular community. Then, each of these sections of the mural will be become one of the many storybook pages within the overall mural to form the ultimate visual time capsule and create a legacy for a proud nation. As each painting is part of a community mural, each community mural is part of the Canada Mosaic Mural. Each community mural virtually connects to other community murals resulting in a massive coast to coast uniflied mosaic. Throughout the Country, this equates to 100,000’s tiles that will comprise an overall image of train cars connecting Canadians from far and wide! The Canada Mosaic Mural team consults with each Community to learn about important and interesting moments that define the community, its history and its citizens to design key elements for mural. Your community invites participants to paint in workshops facilitated by our Canada Mosaic Mural team. With 4×4 inch aluminum primer-coated panels, brushes and paint, participants will be encouraged to leave their mark by creating a painting that represents their community from their own creative perspective. Every painting will be a story and will become a piece of a much bigger story. 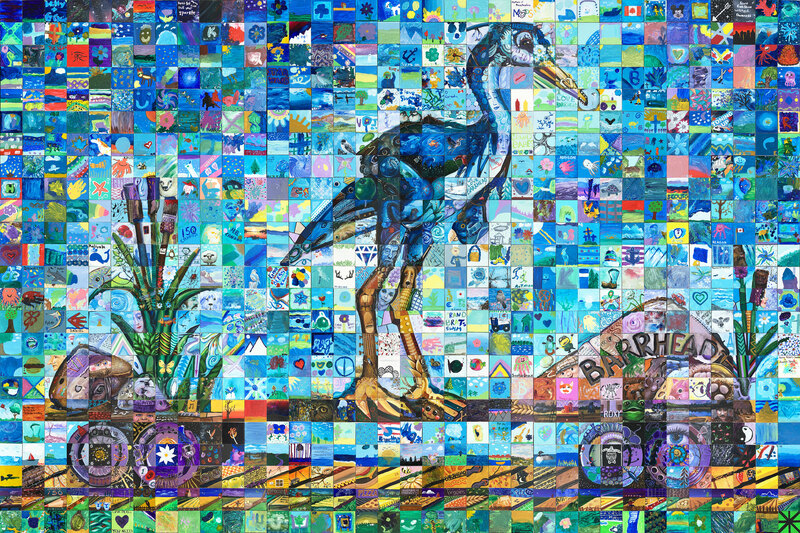 The completed tiles created by the community are assembled into a large mural grid, magically transforming the paintings into a unified mosaic that will represent your community. There are NO DIGITAL EFFECTS – the mural will be 100% hand painted uniting to form another image. Upon its completion, the community mural will be permanently assembled and protected so it will stand as a legacy piece for decades to come – becoming a key piece of the Canada Mosaic Mural. After a Community Mural is installed, unveilings can be turned into big events. Participants make up large crowds to see how their personal artwork finds its place in the big picture and come back time and time again to show friends and family members!